It was a humbling experience to have been able to assist in Santa’s Ghetto’s 2007 in Bethlehem. Each December for six years running, East London screenprint publishers Pictures on Walls have hosted a “squat art concept store” known as Santa’s Ghetto. Usually the venue is an empty shop space, transformed into a wonderland of underground art. Santa’s Ghetto had originally planned a sabbatical in 2007, until the surprise announcement that the show was swapping London for the ultimate Christmas site – Bethlehem’s Manger Square, birthplace of Jesus and home to some fine falafel sandwiches. The square is a prime-spot in this little town; on one side is the Church of the Nativity on the other a Mosque with winding streets heading off into the old city. In the markets dried fruits and textiles can be bought for a few shekels and you can imagine yourself back in Biblical times, although with the addition of cheap plastic Chinese goods. The location is politically significant. 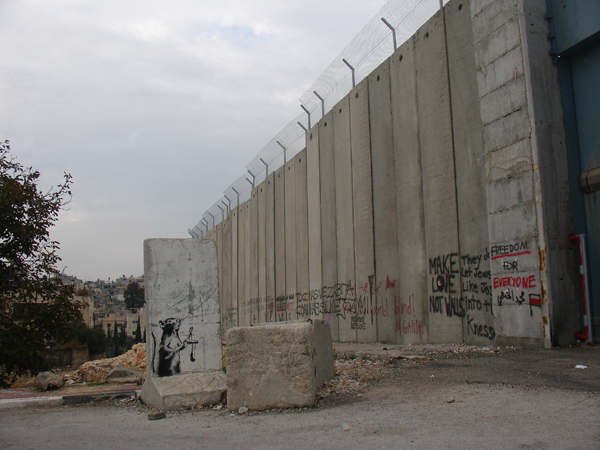 Bethlehem was recently described in a National Geographic article as “one of the most contentious places on Earth”. 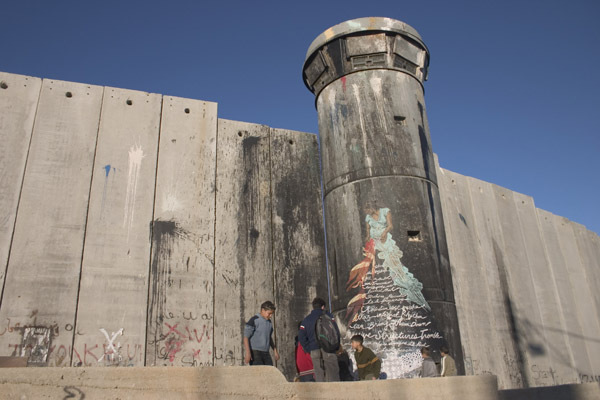 Positioned in the West Bank, on land taken by Israel during the Six Day War of 1967, it’s a Palestinian city that today is surrounded by a separation barrier, an eight-metre-high wall built by the Israeli military. As illegal Israeli settlements surround the city on land stolen from Palestinian families, economically and politically in a stranglehold, life for its citizens is a daily struggle. Given this unexpected environment, the logistics of the show presented challenges and high expectations, starting with the venue. Luckily at short notice a former chicken restaurant became available and, with local supporters working into the night, the dilapidated store was transformed into a rustic gallery space. International artists, including Banksy, Kennard/Phillips and Antony Micallef, alongside some impressive local talent, donated paintings and sculptures. For one month the gallery would be open and the bidding proceeds would all go to local-based charities. Santa’s Ghetto invited close to 20 artists to take part in the project during the month with the idea that more art would get made for sale and draw attention to the event. After talking with and being guided by local people, each artist responded in their own way to the situation. Sketching, sculpting and painting on found materials each artist managed to pull some great work out of the bag, without much preparation and making do with what was available. UK-based artist Paul Insect was responsible for hanging the show and his posters and stencils were all around the town. New York’s Faile collective went large on the wall with a giant rosette that read “with love and kisses – nothing last forever”. While the show was an important element of the project, it was the art on walls that became the most visible statement and got the media attention. Spanish artist Sam3 painted giant silhouettes of people escaping over the wall using an escalator and giant camels, making the most of the walls scale and highlighting its weighty significance. Erica il cane (Erica the Dog) portrayed the wall as a line of falling dominos, while his collaborations with Sam3 had a Biblical feel, using donkeys to tell allegorical stories. Not forgetting fellow Italian Blu who worked the wall hard with images such as a giant kneeling child blowing at a group of soldiers, who crumble away into a pile of dollar bills. In mid-December a second wave of artists arrived – this time from New York. Contemporary pop artist Ron English, well known for ‘liberating’ commercial billboards, hit the wall with a huge image of a clown soldier and the words “Pardon Our Oppression”, as well as other smaller works. Fellow NY based artist Swoon went to town with an extra special collaged paper work adorning one of the watchtowers, which featured a poem cut into paper and hand-sewn pockets attached to the wall for people to leave their own messages in. Understandably the one artist who created the maximum headlines was Banksy. Arriving sometime before the project his work was unmissable as you entered the city from Jerusalem. The first Banksy piece that confronts visitors is of a dove wearing a bulletproof vest painted outside the Palestinian Heritage Centre. Director of the centre, Maha Saca, said of the image “This is what happens to peace in Palestine. Even the bird of peace cannot protect himself.” Further along the road a second painting of an Israeli soldier checking a donkey’s identity papers was intended to poke fun at Israel’s strict security controls and harassment. However locals were apparently divided on the meaning of the work. 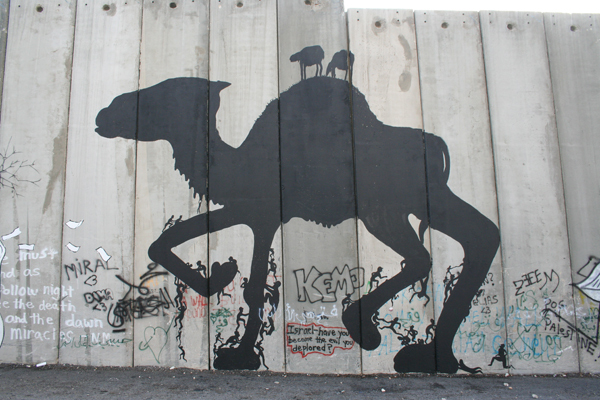 As some saw the humour, others took offense thinking that the image portrayed the Palestinians literally as donkeys. Since the press was asking residents daily what they thought about the image, it’s perhaps unsurprising that eventually someone painted over it. The whitewashing of a Banksy image only created more news column inches and kept the story current. 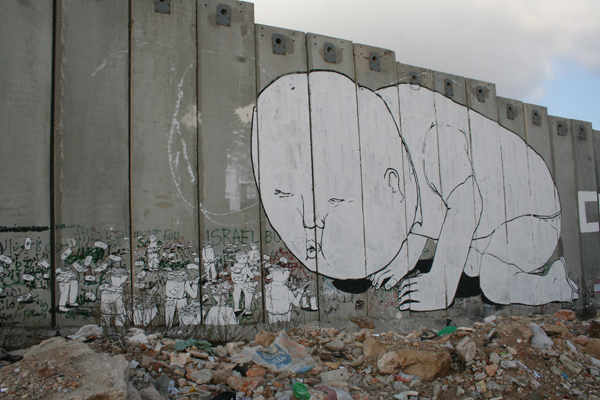 Given the local problems and high sensitivities, perhaps irony is not embraced in the same way in Bethlehem as it might be in London, but if Banksy’s work mainly appealed to foreigners and attracted the media, then it was still a job well done.